Way #1: It’s going to snow tomorrow. Way #2: The Boston Marathon is just a couple of weeks away. Monday, April 16th, to be exact. And, since my office is located mere feet from the starting line of the race and directly beneath the friendly folks who organize the entire thing, there is a lot of buzz. By which I mean, runners – they are everywhere. I don’t have any actual data (I rarely do), but I can tell you from personal experience that our town has more than its fair share of race participants. The gravitational pull of the event is so strong around here that if you have even the slightest inclination to give it a try, sooner or later, you will. And so, in the weeks and months leading up to the race, you end up having lots and lots of side conversations with town residents who are training for the event: The mailman. Your dentist. The college kid across the street. 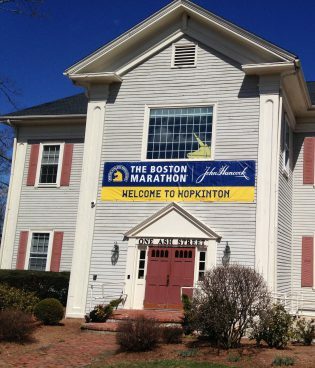 Everywhere you turn here in Hopkinton, Massachusetts, you bump into someone who is training for the marathon. And yes, in case you are wondering, these people like to talk about their respective training routines. They will tell you what they eat and how much they sleep. How they warm up and how they cool down. The clothes they wear and the shoes they prefer. And that’s before they even get into describing the running training itself, a complicated, month’s long process that by comparison makes completing your federal tax return seem as simple as unsubscribing from a long-winded email newsletter (don’t you dare). Nope. These people have a system and, maybe even more important, a commitment to a process that, if followed, almost guarantees that they will be standing on that starting line come April 16th. Here as well, you’ll never realize the results you seek if your “training” regimen amounts to simply doing what you can when time allows and the spirit moves you. That’s the bad news: You need a system and you have to keep doing it. And, unlike training for a marathon, it never ends. The good news, though, is that it’s really not that hard. In fact, if you do it right, you won’t even break a sweat. Compile all your contacts into a single list. You can create a list in Excel; you can use an online tool like Contactually; you can use note cards. The technology doesn’t matter; you just need a way to keep track of who your contacts are and when you last connected. And when I say “contacts,” I don’t mean just prospects and clients. I mean all humans that you know – people that if you called* them up you wouldn’t have to introduce yourself. These people, and the connections they represent, are the fuel of your relationship marketing engine. (*Note to Millennials: “Calling” is when you talk into your phone, with another person, in real time, and they … never mind). Commit to contacting a tiny portion of your list every day. Two, three people … enough that you go through your entire list a few times a year. I do this all the time. Not to sell anything or even promote my work. Just to connect and keep the relationships alive over time. That’s it. Could you do more? Sure. You could publish a newsletter; go to networking meetings; send snail mail notes; speak at local events; post on social media; and on and on. All of which are good ideas and recommended. But if you’re doing nothing (or close to it) to market yourself right now, the place to start is always (I said always) with the people you already know. These are the humans most likely to talk about you, help you, recommend you, and hire you. So start here – keeping these relationships alive – before you go off looking for new connections. Here’s the bottom line. Relationship marketing isn’t hard and it need not take a lot of time. But it does require both a system and a commitment to showing up, day after day. If you don’t have both, you may as well not even bother lacing up your shoes. That’s a delightful story; yes, they seem very smart. Sure … of course … I’d love to see some photos. Yes, indeed, they are beautiful, but I have an appointment and really need to leave. I’m getting in my car now. What system do you use or plan to use – Excel, Outlook, Contactually, note cards, something else – for tracking your relationships? If you liked this article you’ll love the next one. Click here to sign up for future posts and Get 3 FREE Marketing Resources Worth Over $150. You’re the best. Love the humour. Also thinking maybe you should participate in the marathon. Of course we both know you won’t win. But just participate. You never know how much you would like the experience and challenge until you try. Next thing you know you’ll be signing up for next year’s marathon as well. My marathon running window has long since closed (and now that you say I won’t win I’m sure that’s the right decision!). Thanks for reading and writing! 1. Yes, funny you should ask. I have 1 1/2 grandchildren. Ted aged 2 and one on his way soon. I’ve already named him ‘Steve’. Yet his parents don’t seem keen. How can this be? How disrespectful to the child’s venerable grandpapa! 2,3,4 & 5 Have I told you how Ted can count to 193, has nearly finished reading War & Peace, can skateboard doen his street standing on his head, can run a mile in …. Michael … Michael … MICHAEL! I’ll email the photos. 6. I have a custom-made CRM system that does everything I need. It was produced by a most generous friend as a favour. Glad you’ve got #6 under control, Steve! Send photos of the 1 (I can wait a few months for the 1/2). Love this. I don’t have grandchildren. I have run the Boston marathon. I’ve actually drafted a (long) blog called “What Running a Marathon Taught Me about Running a Business: 26.2 Things You Need to Know”. There are a lot of parallels! Right now I use a simple spreadsheet. And am still creating the full list. But it does prove very helpful to “keep showing up” and reaching out! I love the 26.2 things you need to know. Such a perfect example of incorporating the theme into the writing itself! By the way, have you had Sam Adams’ 26.2 beer? It’s rumored to only be available in bars that are in towns on the race route (like mine) but I think it may be new england in general. Another nice harbinger of spring around here is when it’s available this time of year! Grandchildren, no. But I hear my in-laws do. 6. I use a poorly thought out combination of ActiveCampaign and LinkedIn. I may have missed this, but what do you use or strongly recommend Michael? I’ve used contactually for a long time. Simple interface and smooth integration with gmail which I like. My one complaint is that the synching is often off and it can take a long time (sometimes forever) for the system to know you and I (for example) exchanging emails, so that hampers its ability to keep me informed on who I need to connect with. I’ve been trying Prosperworks lately which I’m liking too and will probably switch over to. I love how, in every issue, you relate some incident from Everyday Life into Relationship Marketing — and it never feels forced. The idea of touching base with contacts is fabulous! I don’t have any list for that, but I think plain old Word will be my best bet because I know how to use that. I could even have different colors for school friends, relatives, current & former co-workers, church friends, book group members, current & former students…and your definition of “somebody you wouldn’t have to introduce yourself to” is a perfect way to decide which of them belongs. Glad it hit the spot, Laurie! Yes, it need not be complicated (in fact, if it is, people tend to abandon the entire process). Your approach sounds like a solid one. Can you help us giving some advises based on this “personality” problem? When you make these contacts talk to people as if you just ran into them at a coffee shop. How are you? What have you been working on? I can’t believe how cold it’s been. Here’s what I’ve been doing lately. It doesn’t need to be anything more than a quick connection. The more of these you have, the more business you’ll get. Thanks for your quick reply. I really appreciate your help, but it is still hard to me to do that. But that´s my problem, je, je. Anyway, I will try to do it at least with the closest people and check what happends.